Here’s to another night of cutting fondant with an exacto knife. Buttercream icing was the choice of icing. I tried elevating the cupcakes to make them look like a screen shot but I’m running late for The Taste of Dallas, so I threw this together. The flowers were my favorite, but most time consuming. The Mario and Luigi are collectible dolls because I wasn’t going to take on the headache of making them with fondant. It was a really tight week this week with work and everything. How did I do? 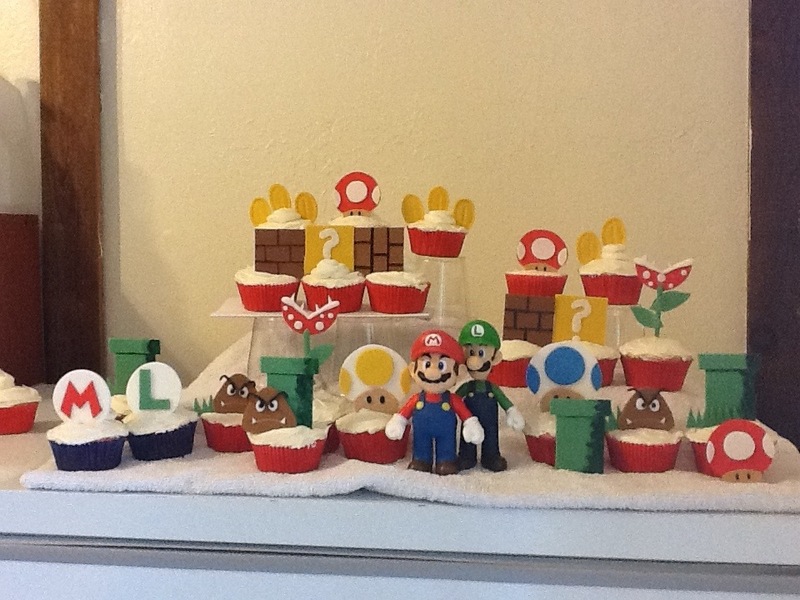 This entry was posted in baking, cupcakes, desserts, fondant, food, icing, mario bros. cupcakes, pastries and tagged Baking, Desserts, food. Bookmark the permalink. thank you!!!!!!!!!! every time i work on fondant decorations, it takes me days (i gotta do it in between work and sleep)…and then when i’m done, the first thought is always, “ugh…it’s not the way i wanted it…” but no one really knows what i had envisioned in my head, so it ends up being alright-looking. haha! i wish i had built a ladder-type structure to put them on, though. it would have been cooler. Here all this time I was thinking you were going to make a play doh animation! You sure fooled me. What was this all for? this was for my good friend’s birthday which happened last night. he absolutely loves mario bros. and during the fondant cutting, i realized that there were a thousand versions of mario bros games, so i started freakin’ out…but i think i kept it to one. his wife kept saying, “well, that’s the other game…” gah! haha! You truly are a wonderful person Sierralei 🙂 You did this all for a friend and at the same time let us into your life 🙂 You put up with my dumb humor and lame questions to boot! Thank you my friend… your Texan is showing! This is amazing! I love it – especially the retro-ness of it all. I grew up wanting a Nintendo game console and only being able to play Mario at my friend’s houses. Ahh, brings me back! yeah! it’s big with a few of my friends and my sister. they love their mario bros. the funny thing is that the birthday party was hawaiian themed except the cupcakes. hahaha! no. oh, nooooo. if they said, “for this round, you are going to have to incorporate tuna in your cupcakes,” i’d just take my apron off and walk out. i mean, there are just SOME THINGS you just SHOULDN’T put in your cupcakes. i saw the episode in which the lady chose to incorporate salmon and i wanted to hurl. but i love that show!!!!!!!!!!!! why, thank you! there was a bunch of blood, sweat, and tears poured into this one. hahaha. unfortunately, i didn’t get one. haha. it’s always cool when things bring back good memories. at least i hope those were good memories. but then again, why would mario bros bring bad memories? oh, right, because I’M TERRIBLE AT THE GAME AND i always die. yeah, those are 2 awesome games! one day someone will make me cupcakes. hahaha. They look amazing. I’m still – and probably will be for a while – a fondant noob. It’s either too soft or too hard, and is my cupcakey nemesis. I am in awe of your patience in working with it, and the finished cuppies make the cupcakey and geeky me’s very, very happy! Cupcake on! why, thank you! yeah, fondant makes me want to break things sometimes. and it also depends on the weather. oddly enough, the fondant was drying faster than normal with these. and it usually rains when i mess with fondant, which takes it forever and days to dry. maybe it’s because i had a fan going while i was doing them. or maybe it’s because i’ve played with them for so long that i’ve got it down and didn’t realize it. i think it’s the second one. ha! this looks amazing 🙂 If it was me I would probably have trouble with putting those swirly icing on the cupcakes 😛 I have no idea how you make these but they look great! thank you! sometimes i have no idea how i make them, too. Amazing!! You are awesome with decorating and the cupcakes look delicious! Good job! like i said…you bake, i decorate…we’re set! but you’re really good at both, so i’ll just do what you don’t want to do. hahahaha! Those are so awesome!!! You should have your own bakery!! This is absolutely amazing!!! I love this! I’m such a huge Mario Bros. fan. Oh wow! The flowers are my favorite part, too. Really well crafted! Awesome! The Sgt. Pepper Cake in the last few photos is my favorite! These are adorable! I need to learn how to use fondant!